This beautiful North facing Villa is tucked away in its own sheltered, private gardens surrounded by a back drop of tall Marri and whispering Peppermint trees. With direct 4wd access to Margaret River's famous Kilcarnup Beach and Joey's Nose and the Margaret River a short walk away, guests have the choice of both ocean and river. This passive solar Villa has a large kitchenette with all modern appliances and is completely serviced by Rain Water and Solar Power while the spacious bathroom has its own private tropical garden outlook. Boasting a reverse cycle, split heating and cooling system that will make your stay comfortable no matter what the weather conditions. For those who enjoy their sleep or just prefer to cozy down in the evening, the Villa has a luxurious King sized bed and massive 10 foot block out curtains. Nearby access to the 'Rails to Trails' and 'Cape to Cape' tracks that wind through national parks or along the stunning South West coast line makes this a surfing, swimming, diving, fishing and bush walkers paradise. Surrounded by world famous wineries such as Cullens, Vasse Felix, Brooklyn Valley, Evans and Tate and Howard Park's Mad Fish where wine tastings and delightful lunches can be enjoyed are minutes away while the Margaret River township and Surfers Point are just a short drive. An undercover car park with extra space for your boat or visiting friends is provided. Further amenities include remote TV, DVD player, In-house movies, Bose sound system and a fully serviced laundry with dryer. 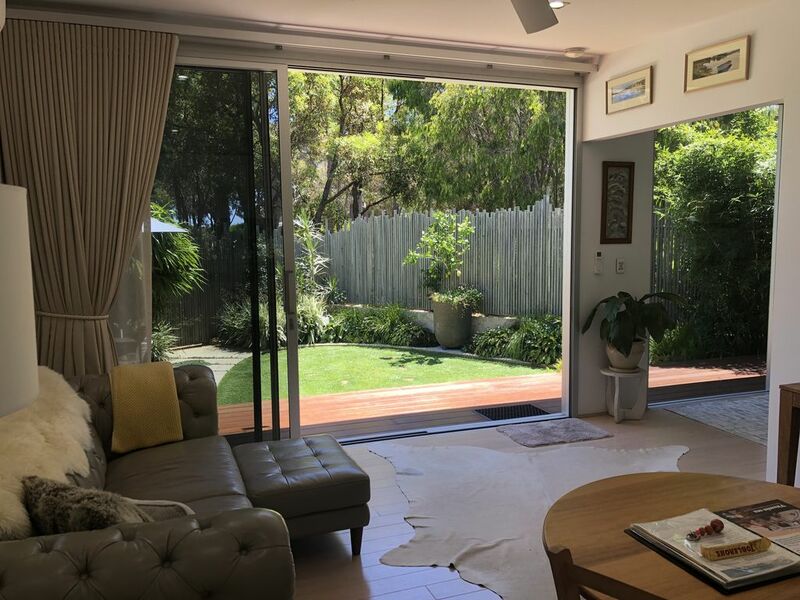 There is a private, fully enclosed, secure courtyard that comprises of decking, grass, and a protected undercover entertaining area that your pets will feel at ease in. If staying with your pet, a 10% surcharge applies. Please also note that pets are outside only. A selection of tea's, coffee and chocolate are included to further enhance your stay.